I'm not sure if this is the right place, so please pardon me if it's the wrong board for this kind of thing. Some time ago (when I was using Ubuntu MATE), I came up with a design for a desktop and theme, as a kind of art project. I thought it might be interesting to try to adapt some of it to Puppy sometime, but I'm not sure whether JWM is configurable enough to make it up to the task. Here's a snapshot of one of the more recent pictures. Mind you that not everything is perfected, and this isn't a picture of an actual system, just a drawing of one. I took a preliminary look at JWM to see whether there was a good way to implement some (probably not all) of these kinds of changes. One big thing that is in the way, though, is that I'm not sure there's a way to use a texture or patterns of certain colors, instead of a single solid color, for many of the interface elements. I'm also not totally sure about the clicked/inactive/hover effects for buttons, the drag strip at the bottom-right of the window, or, well, much of any of this. If there's not really any way to do it in JWM, that's fine. I like the JWM default look well enough. That said, I am curious as to whether IceWM would be better for this kind of thing, and if so, if it's reasonably convenient to change Xenialpup to it without destroying all of my configuration in the process. I'm not following you too well . I don't understand though what you want to do with new folders? You can change the background ,alter the desktop icons , have as many additionsl desktops as you wish so where are you going . One question I wish answered if you have some experience in window managers is if I start a program at bootup , how can I get it to start on desktop 3 ? It needs to change focus to desktop 3 before the program opens obviously ,but perhaps it might then need to go to desktop 1 to open something else , but it cant until the graphics begin to open at least on desktop 3. Always, always tell us what Puppy version you are using?????? Have you tried to use any of the setting options you can find in menu>Desktop>JWMdesk Manager? This topic in the forum has all kinds of stuff you can add to the options the above offers. Just make sure, anything you download and install, gets put in the correct location, so it shows up in the listed options. if i understand you right, you want to change buttons, progressbars and so on. jwm only alters windowtitle and taskbar. you are looking for gtk-themes, i guess. 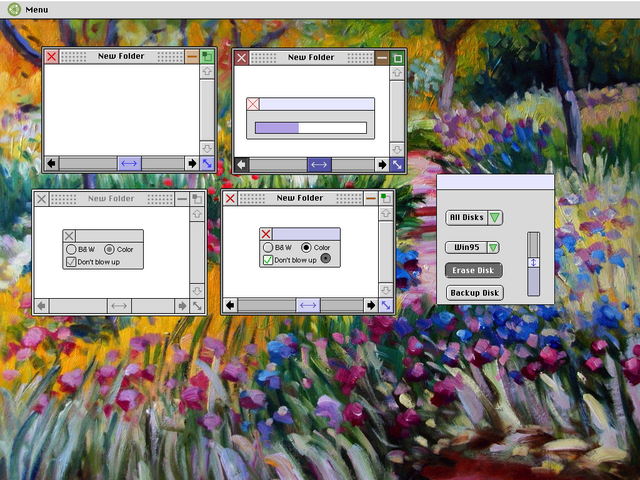 Some time ago (when I was using Ubuntu MATE), I came up with a design for a desktop and theme, as a kind of art project. I thought it might be interesting to try to adapt some of it to Puppy sometime, but I'm not sure whether JWM is configurable enough to make it up to the task. Obviously? Not if you use JWM's group settings. The program would start in the desired desktop but would not take focus and the desktop would not switch to the desktop of the started program. Thank you ever so much . I will investigate those . Thank you too MochiMoppel ! bigpup he says Xenialpup in the first post . @april: If you don't use JWM then wmctrl may be your only choice, but you need only 1 script. Following code will open myapp as any other application you start at bootup, presumably in desktop 1. It may take a second or even more before the window appears, so let the script take a short nap. Wmctrl then takes the active window (almost certainly the program you just started) and moves it to desktop 3. Your current desktop 1 does not change, so there is no need to switch back from 3 to 1. Note that wmctrl counts desktops from 0. Desktop 3 in the example would be Desktop 4 in JWM.